With a calendar overflowing with themes and events, it is not surprising to find occasions where two celebrations offer a curious clash. This Saturday Paris will celebrate both the Nuit Blanche and the Jour de la Nuit, two events which promote radically different perspectives on city nights. The Nuit Blanche, celebrating its 10th anniversary in 2011, is an open-air party, bringing thousands of curious citizens out onto brightly illuminated street stage sets. The Jour de la Nuit on the other hand seeks to bring darkness back to our cities. As the promotional material proclaims, it is "une opération de sensibilisation à la protection de la biodiversité nocturne et du ciel étoilé ainsi qu’une prise de conscience du problème de pollution lumineuse" (an awareness campaign to protect nocturnal biodiversity and starry skies as well as an appraisal of the light pollution problem). It is an event covering the whole of the country, but whilst there are some parts of the national territory that are already among the darkest parts of Europe, it is the city which is the real battleground. In Paris, the events organised this year are far smaller than the funfair of the Nuit Blanche, but they may be just as thought-provoking. 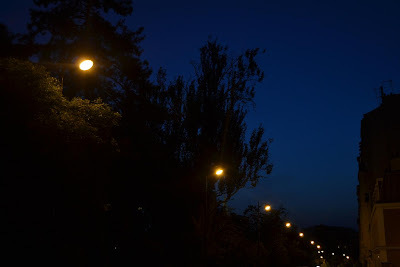 Near the Parc Montsouris, amateur astronomers will attempt to peer through the city lights and show Jupiter and its satellites to curious passers by, but perhaps more interesting still will be a night walk through the Parc Montsouris itself. The Nuit Blanche gets people away from their beds, but through actions that turn night into day rather than through initiatives that help them to discover life after dark. Organisers of the night walk though will show how an urban park changes at night, pointing out the fauna and flora that come alive when the sun goes down. This weekend, Paris lets you choose your own vision of the night; festive and artificial, or natural and hushed. Unless you decide to take a trip through both worlds. For a list of suggestions for the Nuit Blanche, see my post on the Paris Weekends blog. I was a bit disappointed from what I could see, like the last two years… Maybe I have not visited the right places ?